If you enjoyed the previous version of this skill game where you've been a destructor, this new one will shock you with the upgrades that appear. As you've learned you have to use your mind in this game because there is no way out of this situations without a good strategy. There are many challenges prepared for you and each level has a different way to test your fresh gained skills, so earn money and keep buying new bombs to keep up with the difficulty encountered. 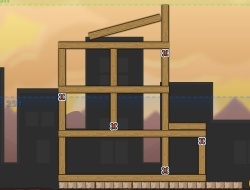 While you advance you'll notice that demolating a building is not that easy anymore and you should use all your forces to get that thing down. Place the dynamite where you consider is the most properly spot to cause a bigger damage and also to get the construction under that requiered line. Win money and use them to improve your ammunition. Don't give up until you finish the whole game and take your entusiasm with you. Use mouse to place dynamite. Demolition City 2 0.00 between 0 and 10 based on 0 votes.